I think dreadlocks are a terrible hairstyle. The hair is matted and funky, since you can’t wash them regularly. I recall seeing a guy who got his dreads cut at a barbershop,and had a green fungus growing on his scalp underneath. That did it for me. But to each his own. And that goes for white people who want to wear it as well. Since when is a hairstyle something that a culture owns. As much as I detest the mullet, if a black man wants to wear it, he shouldn’t be harassed. Laughed at, yes; but not harassed. 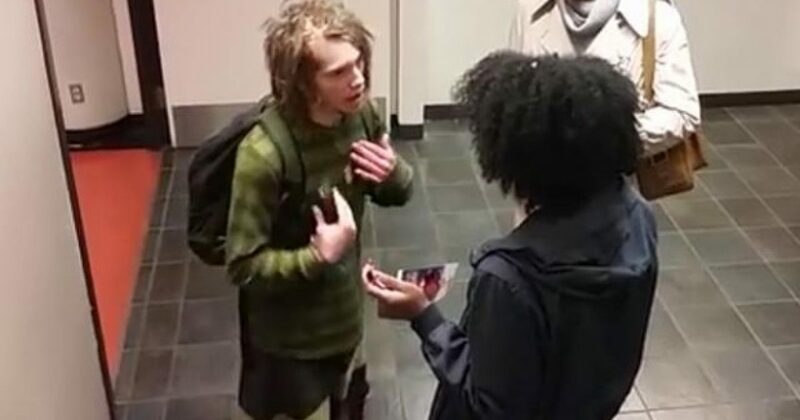 But when this white college student was wearing his dreads, he was obviously outside of the white “safe zone” and entered an area for ethno-centric (racist) black kids. That’s why a black woman decided to call him out for wearing a black hairstyle. Finally, she notices that she’s being filmed by “cop cam,” then assaults that person. America is fooled into believing that colleges and universities are places of higher learning, when they are in fact places that teach and practice racism openly, and particularly by blacks with enabling whites nearby. These are cults that we fund, and it’s time that it stop. This girl should be forced into DIVERSITY training. Isn’t that the solution for all Leftists?